I venture to say that there's thousands of fake and counterfeit silver dollars in existence, but most are obvious fakes. 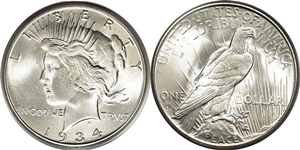 However, to untrained eyes, most people don't realize the difference between authentic and counterfeit silver dollars. Plus, some of the better counterfeits can fool people who have had some experience with coins, and nothing short of a weight or closer examination next to an authentic coin, before they realize the coin isn't authentic. I hope these information and images, on these web pages, will give you the edge you need to identify most counterfeit or fake silver dollars you might see for sale. One important fact to remember; All coins that are copied or reproduced from U.S. Coin designs are counterfeit and are illegal to own. Only one exception, according to the Hobbies Protection Act 1973, is they must have the word COPY clearly and obviously stamped onto the coin's surface. -have a "dirty" luster or even specs of grime imbedded in their surface. -their surfaces look pock-marked, grainy and imperfect. -the design is smashed or is misshapen or entirely the wrong font type. -not the correct weight, diameter or thickness. -incorrect dates and mint mark combinations, plus dates and mints that never existed. -are made of cheap "pot" metal, steel, but some can be made of silver. 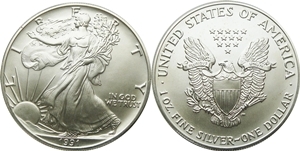 -slippery feeling or just don't "feel" the same as authentic silver dollars of 90% silver. -of extremely rare and valuable dates and mints. -inexpensive and too cheap of a deal considering how rare authentic pieces would sale for. 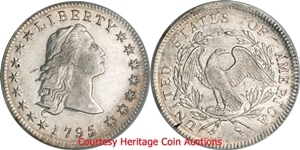 This is just a few things to remember but the images, I provided on the web pages listed above, should suffice for identifying most counterfeit silver dollars. 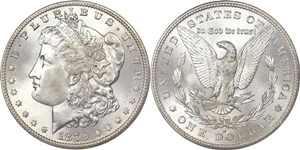 Each silver dollar type above was only minted during these years as shown, but you also must take note of what mint mark was used on each year, and never buy a year that has a mint mark not used for that year. 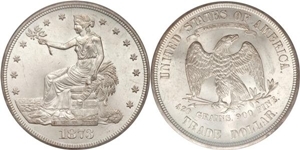 In example, a 1921-CC Morgan Dollar never existed nor does an 1872 Trade Dollar. So know your types, know your dates for each type, and know the mints that minted the coin date for each year. 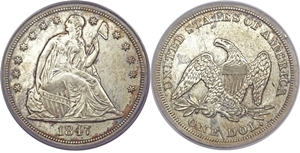 Learn how to identify fake and counterfeit US Silver Dollars. 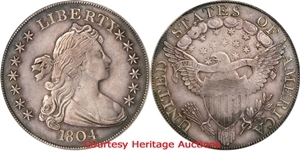 Images and comparisons of counterfeit and authentic Flowing Hair Dollars, Draped Bust Dollars, Seated Dollars, Trade Dollars, Morgan Dollars, Peace Dollars and American Silver Eagles.